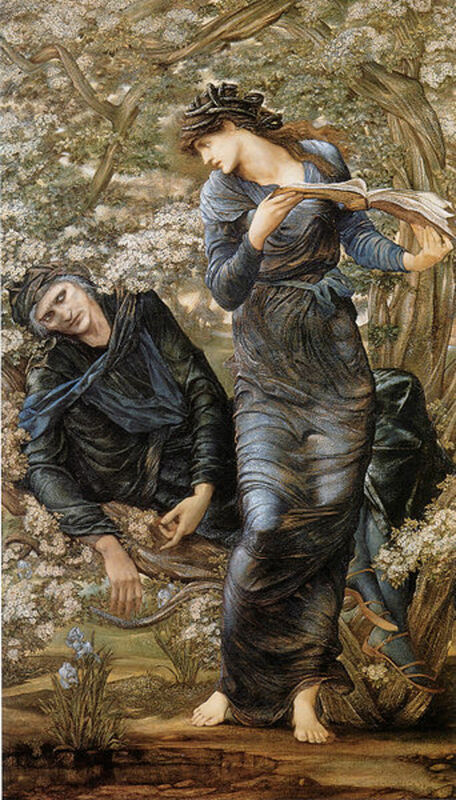 Who was Merlin, really -- more intriguing, what was Merlin? Was he a sorcerer? A Seer? A magician? A prophet? A warrior? A shapeshifter? Was he a trusted counselor and emissary to the High Kings, including Arthur? Merlin was all this and more. He was also the author of "Prophecy" which Geoffrey of Monmouth translated for the world. Merlin was loved by many and feared by most. He was known by different names (Myrrdin, Ambrosius Merlinus, The Emrys) however, as Geoffrey of Monmouth claimed in the year 1136, “Merlinus qui et Ambrosius dice-batur” (His name is Merlin.) -- and that is the name most people call him. Most of us know Merlin as King Arthur's trusted advisor and mentor. The first appearance of Merlin seems to appear in the Historia Regum Britanniae (History Of The Kings Of Britain), which was written in 1136 by Geoffrey of Monmouth. It is believed that Geoffrey based Merlin's character on earlier figures of both legendary and historical significance. These figures Geoffrey supposedly drew on were Myrddin Wyllt (Merlinus Caledonensis), and Ambrosius Aurelianus. From these two men, Merlin Ambrosius was created. Myrddin Wyllt, a historical person, lived in the late sixth century in Britain (c. 540 - c.584). He was a North Brythonic prophet and madman with no connection to King Arthur. Apparently, Myrddin Wyllt fought in the Battle of Arfderydd in Cumberland and lost. After losing the battle, Myrddin went insane and retreated to the forests to live with animals. The battle that Wyllt lost was in the same general area that another person by the name of Lailoken fought. 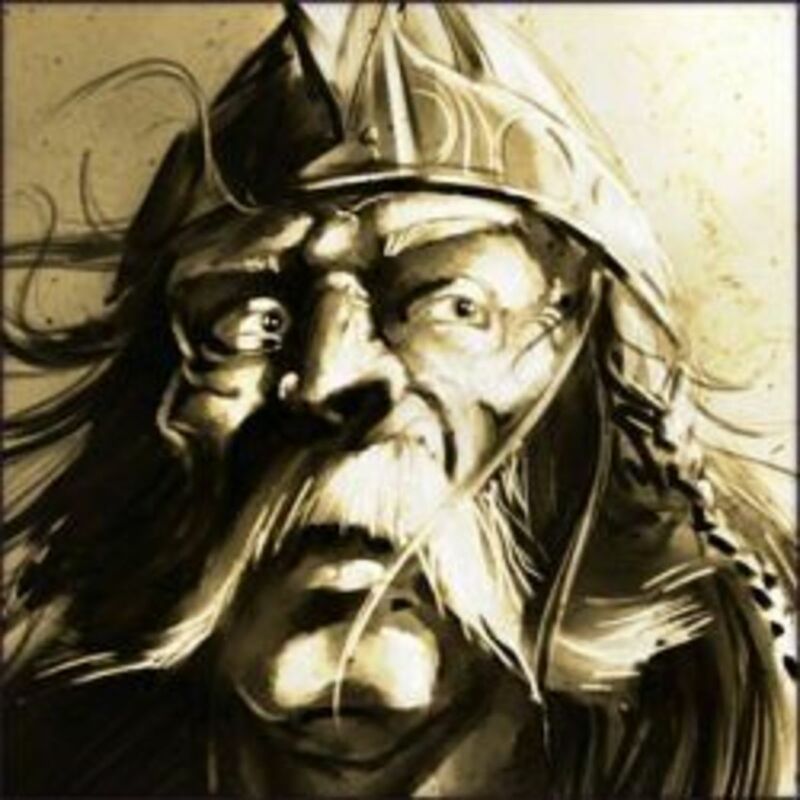 It is possible that Wyllt is the same person known as Lailoken, who was also a Northern Brythonic seer and prophet of the late 6th century and was considered a fool. 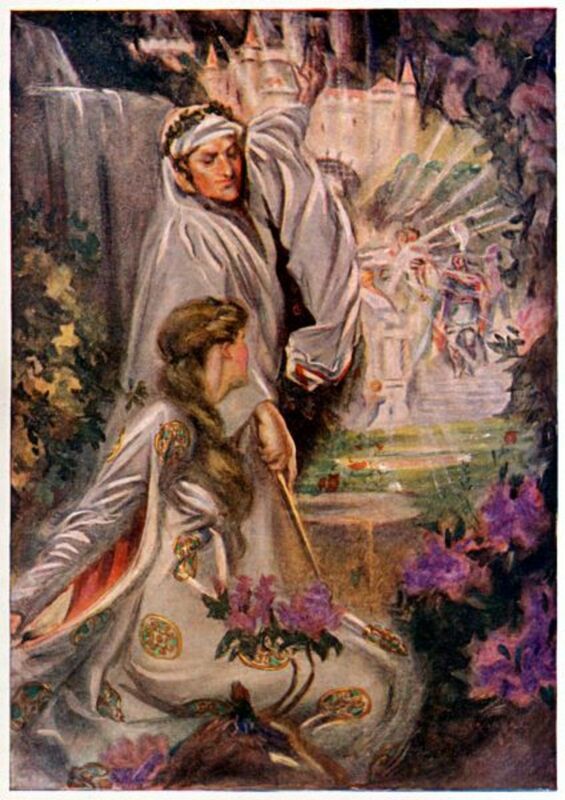 The story of Lailoken as a wild man and seer living in the forests of Southern Scotland very closely matches that of Myrddin Wyllt, who was one of Geoffrey's prototypes for King Arthur's Merlin. The other prototype Geoffrey used for the Merlin of Arthurian legends was Ambrosius Aurelianus, a Romano-British war leader. Aurelianus was of aristocratic heritage of high birth and had Roman ancestry. 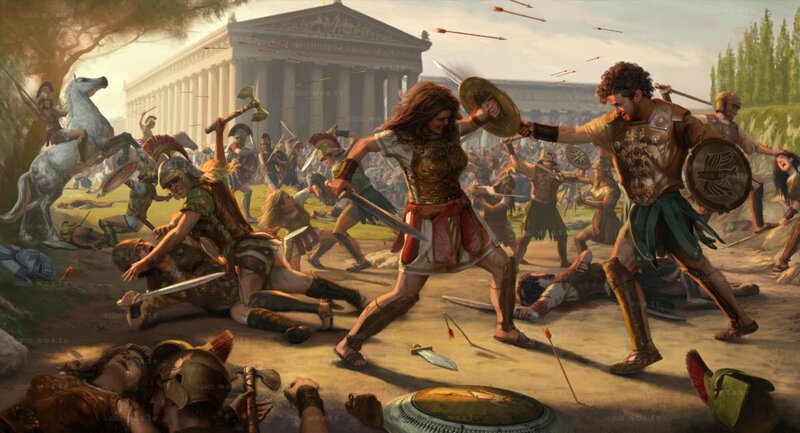 Aurelianus fought against the Saxon invaders and won. 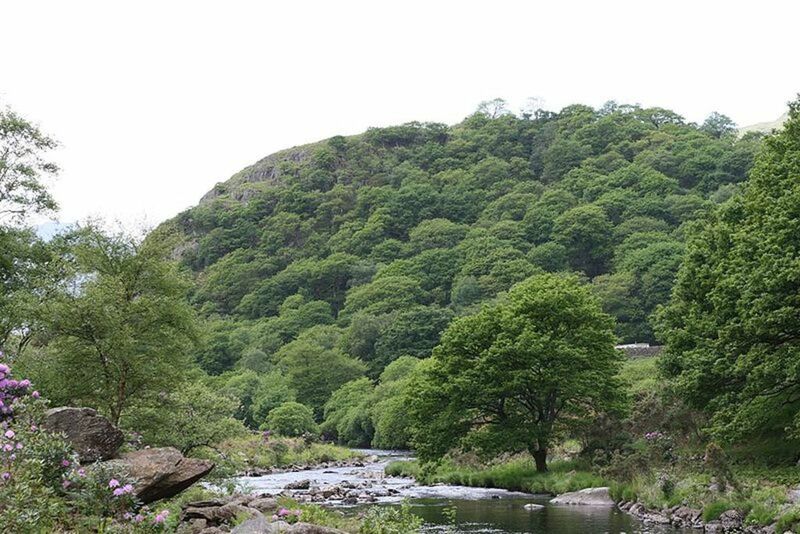 In Historia Brittonum (History of Britain), by Nennius, it is the Ambrosius Aurelianus who met with Vortigern to discuss the two dragons beneath Dinas Emrys (the castle Vortigern was trying in vain to build). Geoffrey used this bit of history for one of Merlin's famous adventures. By combining the stories and characteristics of these two historical figures and possibly others, Geoffrey of Monmouth created a Merlin of very interesting character. Have you read about Merlin and do you believe he really existed? Yes, I have read about him and believe he was a real person. Yes, I have read about him, but real?..... surely you jest. Geoffrey has Merlin born a cambion of a mortal woman and an incubus (demon in male form). 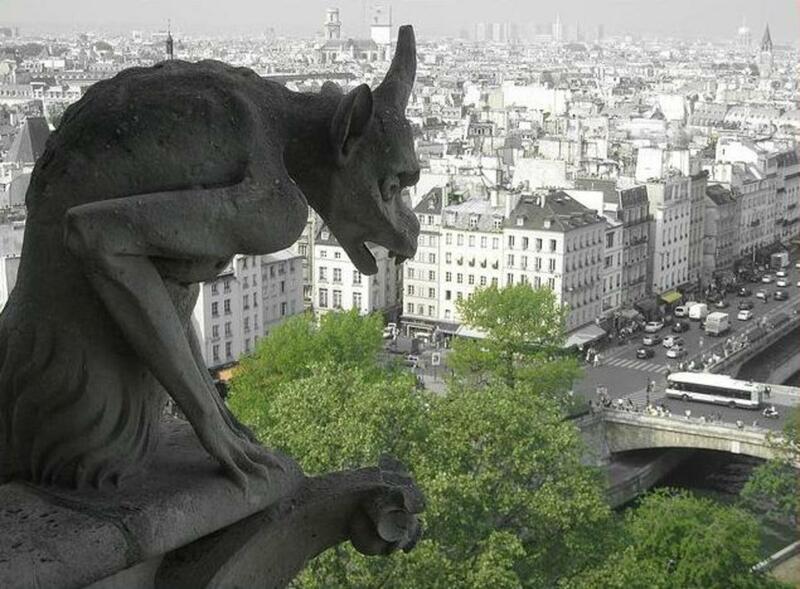 Merlin inherits his supernatural powers and abilities from this demon. A cambion is a being that shows no sign of life yet appears alive. It has no pulse, no breath, and only slightly resembles a human child. By the time the being is around seven years old it is difficult to distinguish from a human. At the age of seven, Merlin had knowledge and abilities far beyond any human. 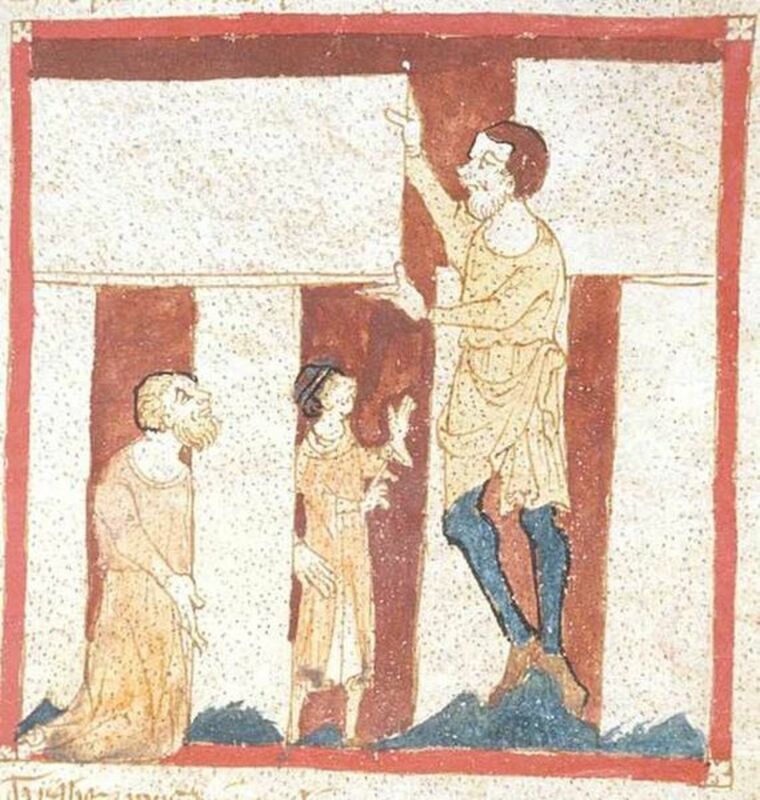 Geoffrey made Merlin the creator of Stonehenge, which Merlin built with the help of a giant. This circle of stones was the burial place of Aurelius Ambrosius. Merlin, still under Geoffrey's control, then arranges the birth of Arthur. By magic and intrigue Merlin brings together Uther Pendragon with Igraine, the wife of his enemy, so that Arthur becomes the next in line for the High King. Geoffrey also gave us the great Prophetiae Merlini (Prophecies of Merlin), which he claims to be the actual words of the legendary Merlin during his days of madness in the wilds. Having created such a fascinating character (what we would today call an overnight sensation) with great and seemingly unlimited power and potential, Geoffrey of Monmouth then leaves Merlin to wander off into obscurity. Was this to be the end of the legendary Merlin? So, when Geoffrey abandoned Merlin to obscurity, was that the end of the wizard? No -- for Merlin returns from obscurity without the help of Geoffrey. This being called Merlin that Geoffrey created could have been an evil monster had he not been brought back by a French poet of the late 12th and early 13th centuries. Robert de Boron pulled off a miracle when he had Merlin's mother consult Blaise, a Master Druid. Blaise had Merlin baptized a Christian immediately upon birth, which thwarted any plans for the evil destiny of the child. Blaise then becomes Merlin's teacher for life. From this frightening beginning in life, Merlin then grows to become a sage who is well known for his powers. Geoffrey did not remedy the demonic potential of Merlin, but Robert de Boron did in his poem, Merlin, several decades after Geoffrey left Merlin to walk off the pages of history. Robert de Boron adds much to the character of Merlin and his legend. Robert adds weight and prominence to Merlin's powers as a shapeshifter and also gives the magician a great sense of humor. 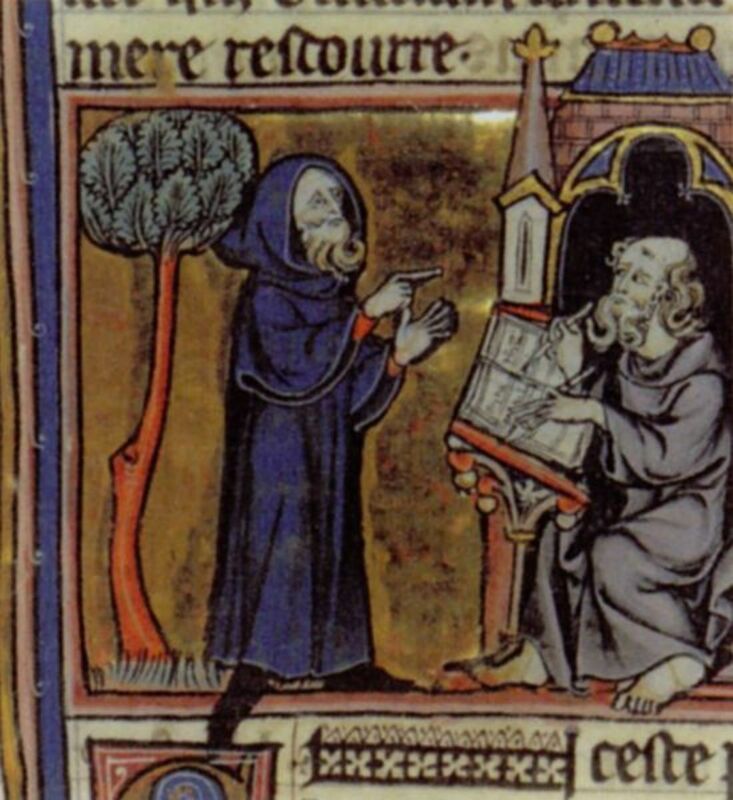 Merlin's connection to the Holy Grail (appearing first in works by Chretien de Troyes, another French poet in the 12th century) is expounded upon by Robert. It is Robert who introduces Blaise as Merlin's master. Blaise takes it upon himself to write down all of Merlin's deeds, and tells of how they came to be known and preserved. Robert's poem was re-written in prose as Estoire de Merlin. It is also referred to as the Vulgate or Prose Merlin. Originally, Robert had the poem attached to a cycle of his poems in which he tells of the Holy Grail. Robert put great emphasis on Merlin's shapeshifting abilities. Merlin appears under Robert's pen as a woodcutter with an axe dangling from his neck, a ragged coat, bristly hair and bushy beard. In the forest of Northumberland, Merlin was found by one of Uther Pendragon's men. That time Merlin was an ugly man tending a herd of beasts. He was also seen as a very handsome man, a beautiful boy, a peasant who was tall, dark and bristly, cruel and fierce looking, and as a short hunchback with a long beard and in tattered clothing. 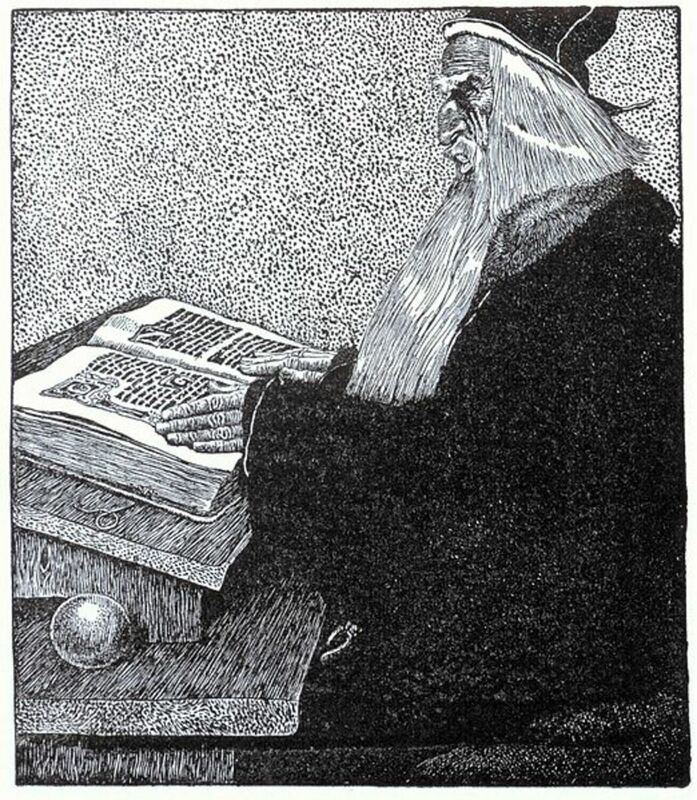 Other authors followed Robert's rendition of Merlin and added their own embellishments to the legendary character. The Prose Merlin was like a prequel to the Vulgate Merlin Continuation in which the early adventures of King Arthur come into the legends. In Livre d'Artus, Merlin appears to Julius Caesar in the form of a huge stag. 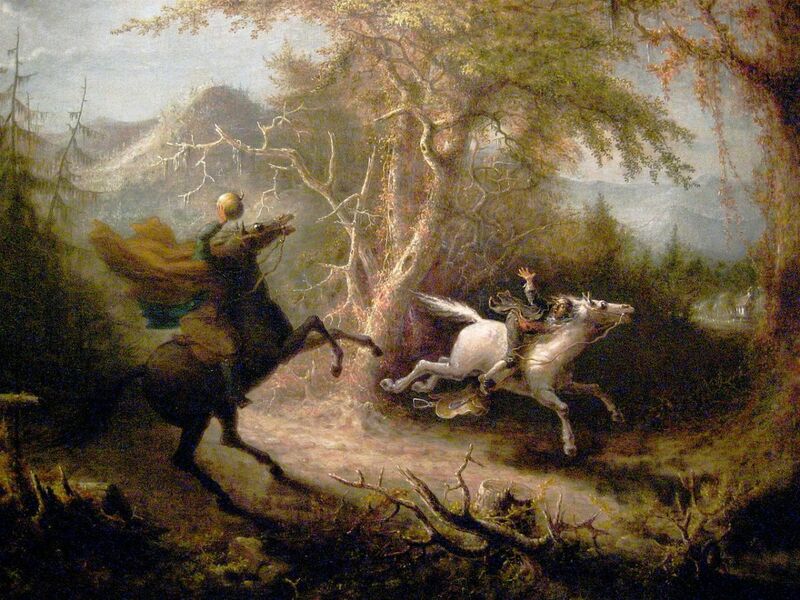 He tells Caesar that the only one who can interpret the troubling dream Caesar had was the wild man of the woods. Inspired by these early works, Sir Thomas Malory then took up the Merlin legacy and wrote Le Morte d'Arthur, which became possibly the best-known work of Arthurian literature in the English language. Mallory became the principal source for many modern writers of Arthurian legends. T. H. White used Mallory as a source for his popular The Once and Future King just as Tennyson did for The Idylls of the King. In 'The Once and Future King', White portrays Merlin (he spells it Merlyn) as a delightful, loving, sometimes confused old wizard who lives backwards in time. Merlyn takes on the duties of tutoring a young boy named Wart (who obviously is Arthur) to prepare him for the use of power and royal life. Using his great sense of humor, Merlyn turns Wart into different animals for some of the lessons in order to learn from specific points of view. From Geoffrey of Monmouth forward, countless stories, poems, books have been written about Merlin, his legendary and notable deeds. So, our Merlin came back, again and again -- every time another author writes about the Arthurian legends, Merlin returns and lives again. Yet for those who understand and love Merlin, he lives forever. It is a wonderful story. I will be publishing the first part probably later today. I should read some more on Eros. I don't know much about that story. Hi Maurice. Eros was a Greek god and Cupid was his Roman equivalent. I love the Eros and Psyche story. I had it as one of my hubs, but took it down because it was so long. I am going to put it back up after I make 4 or 5 shorter hubs on it. Odin ! one of my favorite gods. I love that image of him as The Wanderer. I must get that book. Phylliss its a very interesting book. There were many other surprises to find. A very interesting book. Another surprise was Odin of Norse culture and Cupid. I didn't know that Cupid was apart of Roman culture. Lots of history about them and invocations to ask for their help. That book was a great find. Hello Maurice. What a delight to hear from another Merlin fan. I will check out that book by Susan Gregg - how interesting. Thanks for mentioning that. I will hop over and read your page on Merlin. Thanks for reading and commenting on my hub. How awesome is this, Carolyn? What a connection we made. 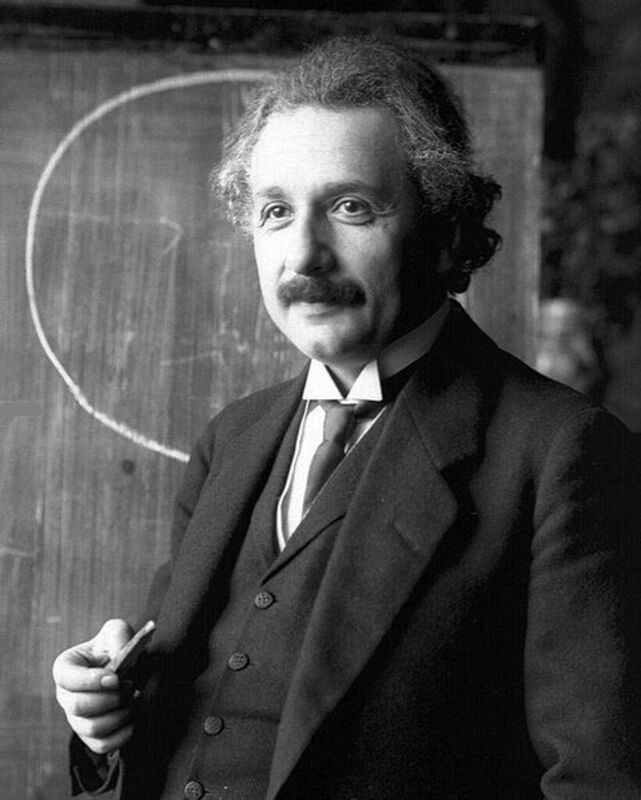 I love that image -- I try to get all of the images I use from Wikipedia. Thanks for loading that image into Creative Commons. I will have to check out Celtic Guide Magazine, sounds interesting. Thanks! Hi Carolyn, I will go check out your Merlin. I love the Arthurian legends. Merlin has always been one of my favorite legendary characters. Thanks for reading and commenting... and for the votes/sharing, I appreciate that. That is what I realize, Keven. We each have our own interests as writers. I love your articles on birds. I am glad you found time to watch it, Marie. I had never seen it before and I enjoyed watching it. Finally got to watch the movie. Charming, to say the least! Hi Kevin. Since Geoffrey of Monmouth first created Merlin there have been many variations and enhancements added to the character. I love the Arthurian legends and Merlin is my favorite. Thanks for reading and commenting. 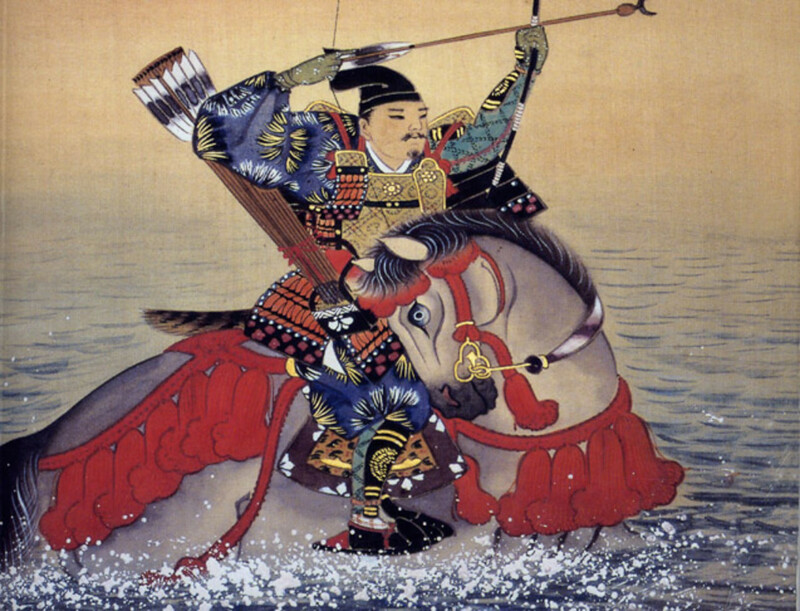 I must admit I am surprised to know someone who is not familiar with a legendary figure that has been so widely researched and written about since the 12th century. But, then history and mythology is my passion so I am very familiar with the legends of Merlin. Thanks again, Kevin. Hi Phyllis, I am just reading this now because I am a little behind in my email. Anyway, I did not recognize him through the whole article; and when I viewed the video I was thinking that I had watched it until the first guy finished speaking. The only Merlin that I heard of was in "The Sword in the Stone". LOL It was an interesting article. It did not sound anything like the small bit of the TV series I saw (on the video). Sure Sheila, you are most welcome. Phyllis: Thanks for listing the books. Hi Sheila. Norma Lorre Goodrich wrote three books (Merlin, Arthur, and Guinevere) that you might be interested in. Goodrich approaches the Arthurian legends through historical facts, actually traveling to and exploring places mentioned in the legends. Like she mentions in her book on Merlin, the history has been "muddled", and quite a bit I might add. Like all legendary characters, we each find our own interpretations and beliefs. There is another book, The Arhurian Reader by John Matthews, that is interesting also. Matthews compiles as much information as he can to try to arrive at the whole story of fact and fiction. Thank you, Sheila, for reading and commenting -- I really appreciate it. Hi Devika. Thank you so much. I am glad you enjoyed it and I appreciate your comment. The only traits of Merlin I was aware of were those written about in "Le Morte d'Arthur" by Sir Thomas Mallory because that's the only book I've read about King Artur and Merlin together. As you said, many movies incorporate the same basic story, so I haven't learned much of the other things you discussed. This hub has added much more to the legend I knew. I've always thought all of the characters have been based on real people (if only loosely in some cases), but the only ones I've read historical accounts about are the king and his knights. You've made me curious and I'll have to find some non-fiction books about Merlin. Thank you, Marie. I appreciate your visit and comment. Take care. Hi Phyllis, it's been a while since I've read one of your hubs. I am keenly interested in this one because my spiritual studies explain Saint Germain, the avatar for the Aquarian age, as having been embodied as Merlin. Merlin was a master alchemist. One of the feats at which the master was adept was "bending" time. This was useful in dropping in on enemy circles without being seen. Saint Germain, as the Wonderman of Europe, was seen to appear and disappear before the royal French court. From a bone of a deer, he created a venison dinner in the hopes of winning the king's trust and persuade him to takes steps to avert the bloody French Revolution. There is an exercise in the book about Saint Germain for students wishing to become skilled in alchemy. One is to focus on the image of a maltese cross and begin to "feel" the object in the hand. After much preparation and concentration, the cross becomes physical in the hand. This is the science of precipitation, a focus of God's fifth ray, which happens to be emerald green. Archangel Raphael and Mother Mary are also on this ray. The gift of alchemy, or precipitation, does not happen until one has learned the tenets of God's love. If you would like to explore the subject further, I recommend the book SAINT GERMAIN ON ALCHEMY published by the Summit Lighthouse. The website is tsl.org. Thank you, Jodah. I agree that Merlin was based a little on Myrddin Wylit. I love Merlin. Each author who has written about the lovable magician gives him a little different personality. I think my favorite is the Merlin in "The Once and Future King" where he is a bit forgetful, lives backwards in time and has a sense of humour. Thanks again, Jodah, for your visit and comment. Hello Phyllis. I enjoy reading about fable and legend and find that most that are continued through the years are originally inspired by real people or events. Most are elaborated on and made more mysterious and exciting over time. This being said, it appears that most of the Merlin the magician legend seems fictional, though loosely based on Myrddin Wyllt. Great hub once again. Voted up. Love the pics. Phyllis, I am spellbound! I've always loved Merlin and the Arthurian legend. My interest was wisely fueled by the two most important persons in shaping my mind and thoughts, my Granny and my mother. And that was many years ago! Loved this Hub, can you writre more on this same theme? Perhaps focusing on some specific detail, like the two dragons, or the sword in the lake, etc? I must take time to digest the video, can't do that right now. Congrats and let's have many more! Up and shared. My gosh, Frank -- you keep me fueled with the desire to keep writing with passion. I love history, mythology, and intriguing stories. And you are one of my greatest motivators. Thank you, kind sir. You surely must be a descendant of Merlin's, for you are an Enchanter.